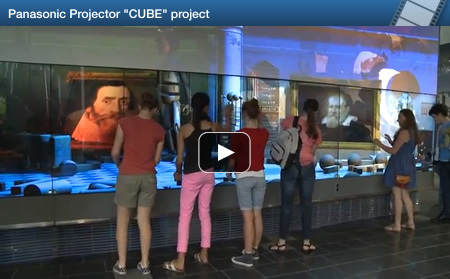 “The CUBE” — one of the world's largest digital interactive learning and display spaces — was set up by the Queensland University of Technology (QUT) to provide an inspiring, explorative and participatory experience of QUT's science and engineering research. 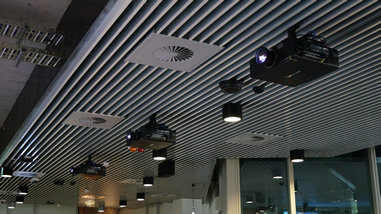 In the heart of QUT's new Science and Engineering Centre at Gardens Point campus, many Panasonic projectors are used. organized groups, University staff and students, and corporate guests. the informative panels with details on the habitat and biology of a variety of ocean creatures. 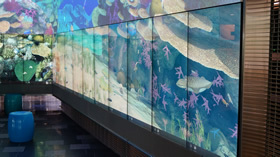 edge-blended images and allow the public to explore the hyper-real “virtual” reef. 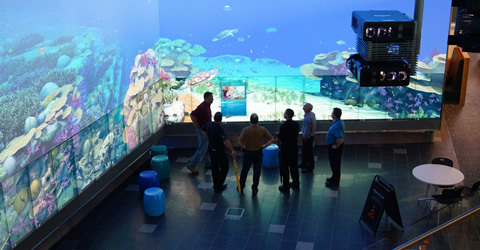 Four PT-DZ21K projectors were edge-blended to create a life-sized virtual reef. themselves with simulations of physics concepts and experiment with the laws of physics. ET-DLE080 short-throw zoom lenses are used. 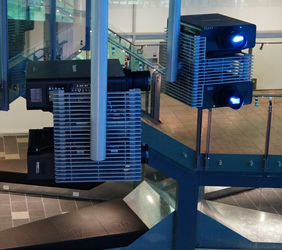 Three PT-DZ6710 projectors with ET-DLE080 short-throw zoom lenses create a seamless image. performance that would enable large-screen projection from a short distance and projection onto non-flat screens. Another difficult problem was effectively fusing the multi-touch display images with the projected images. The Panasonic PT-DZ21K is extremely compact while providing 20,000 lm of brightness. and a Lamp Relay mode allows alternate lamp use to enable 24/7 projection, resulting in economical operation. from being too loud and too hot. In addition to being compact, the PT-DZ21K offers a wide lineup of optional lenses for virtually every application. For example, the ET-D75LE6 short-throw zoom lens enables large-screen projection from a short distance. 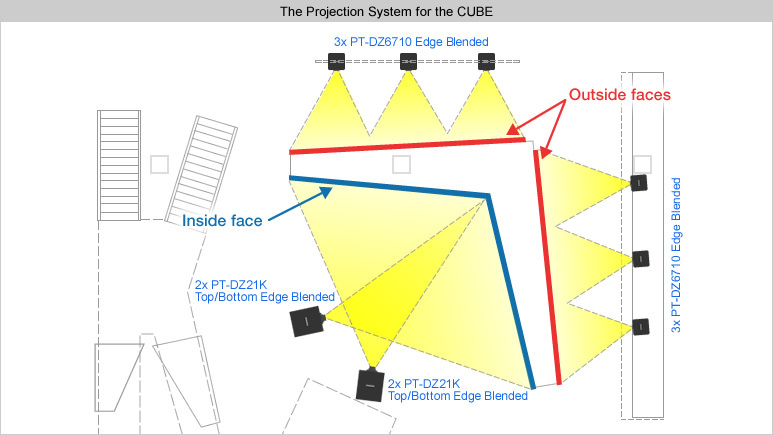 Panasonic’s Geometry Adjustment function also adjusts images for projection onto specially shaped screens, making it possible to project onto the non-flat screens of the CUBE. Furthermore, the Color Matching function corrects for slight variations in the color reproduction range of individual projectors and displays. Panasonic’s technical support and installation advice also contributed to the success of the CUBE Project. variations in the color reproduction range. 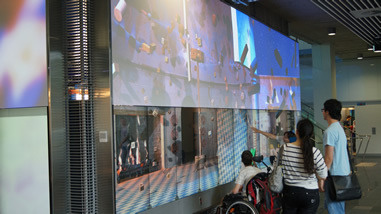 The two-story-high virtual reef is so beautiful and lifelike, visitors almost feel like they are swimming with the fish. 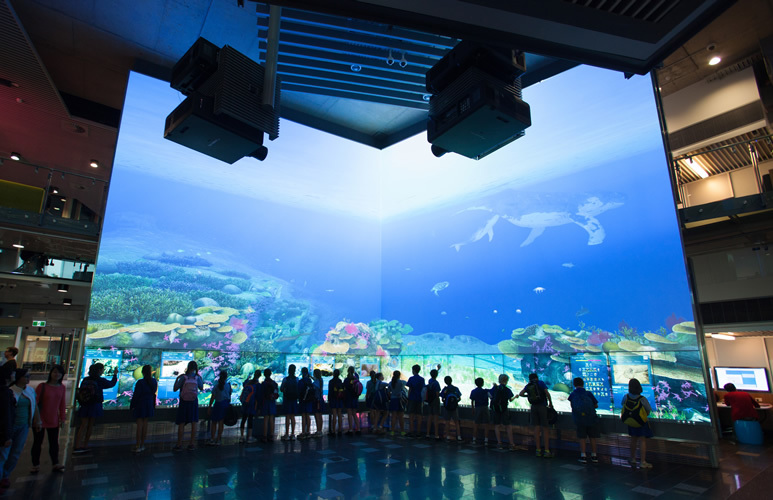 Panasonic projectors support this ‘open’ and ‘living’ laboratory with an application that ideally suits the new QUT facility. 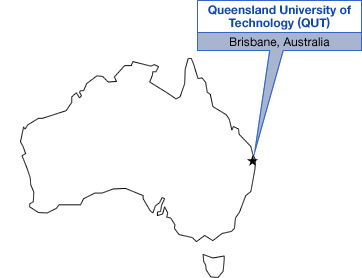 Panasonic projectors are also at work in many other QUT facilities. 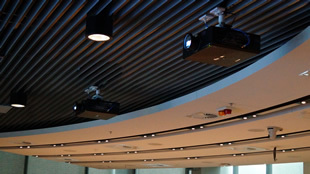 The theater room features PT-DZ6700 projectors, and the lecture rooms have a total of forty PT-EZ570 projectors in all. 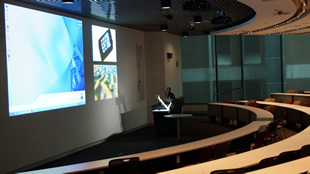 Panasonic’s versatile lineup provides a total display solution that extends throughout the QUT facilities. PT-DZ6700 projectors installed in the theater room.